Greetings from Reference interns Suzanna Calev and Sara Hawran! We have recently completed an exhibit board in the main research room of the John F. Kennedy Presidential Library, entitled “Jacqueline Kennedy’s White House Restoration Project.” Through our research we have come across many interesting documents on this topic, too many in fact to fit in our exhibit board. 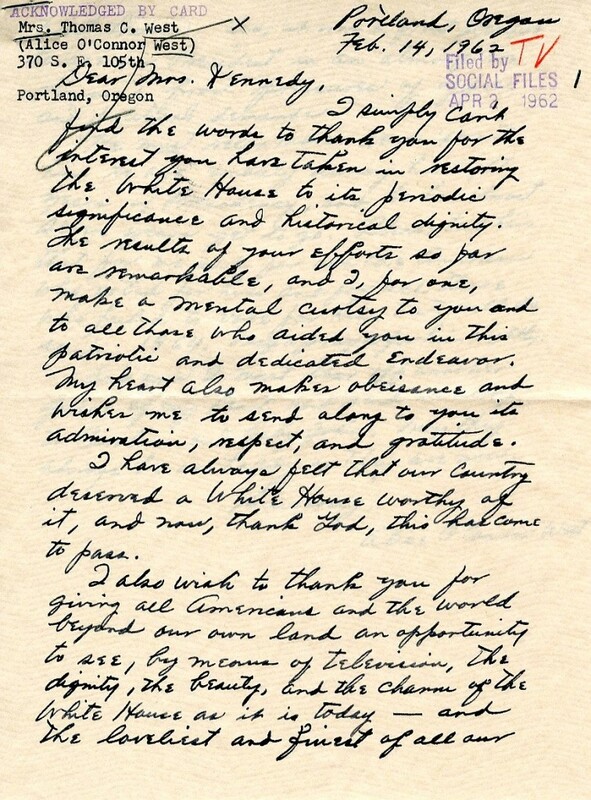 While there is much scholarship written about the restoration, the documents have given us a new understanding of the work that went into restoring the White House and of the dedication of many individuals who made the project possible. We would like to highlight some of those documents in this blog post. 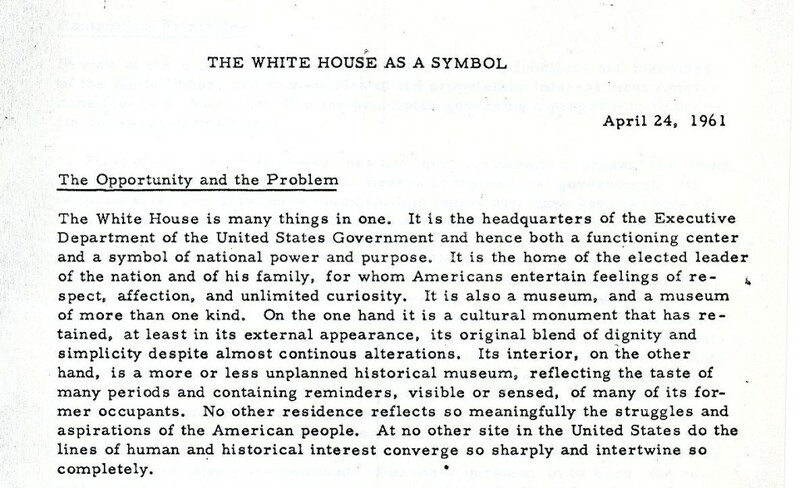 The White House as a Symbol [excerpt]; see digitized folder of material here. 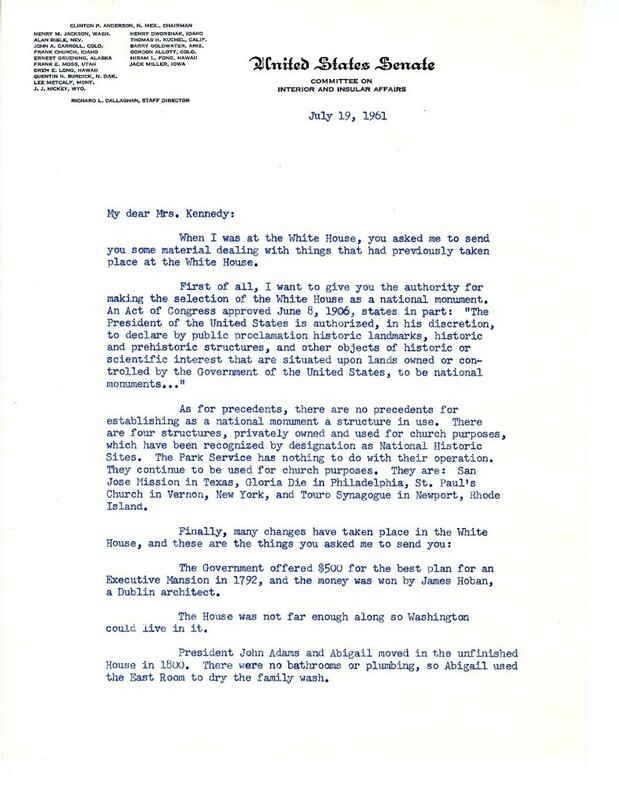 In preparation for the restoration project, Jacqueline Kennedy created a Fine Arts Committee that would help her find antiques from different presidencies. We came across a brief history of changes made to the White House during each presidential era, the narrative of which was written by Clinton P. Anderson, Senator of New Mexico from 1949 to 1973 (reproduced below). 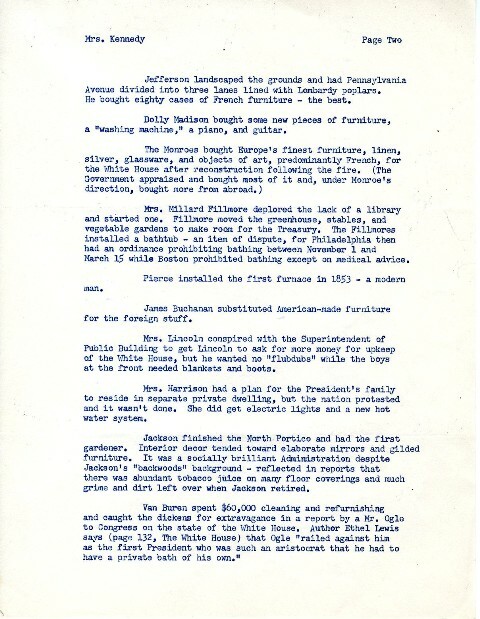 This document was unique because it pulled together the history of White House renovations made during each administration. See digitized folder of material here. For her restoration project, Mrs. Kennedy sought the help of three individuals: interior decorator Dorothy Mae “Sister” Parish; American antiques collector Henry Du Pont; and Parisian designer Stéphane Boudin. With the assistance of Parish, Du Pont, and Boudin, she planned the alterations for each room. 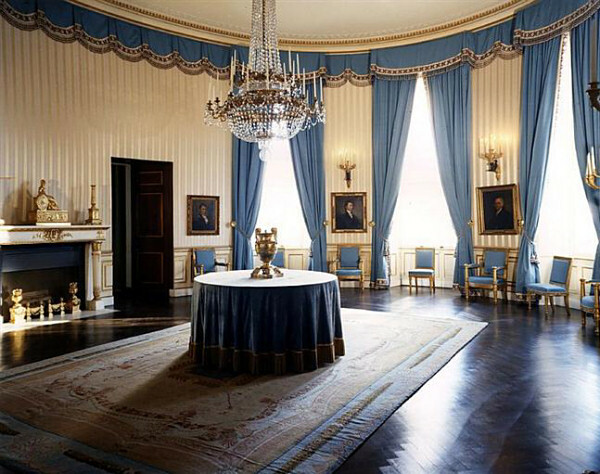 It was decided that the Blue Room would be restored to the period of President Monroe. 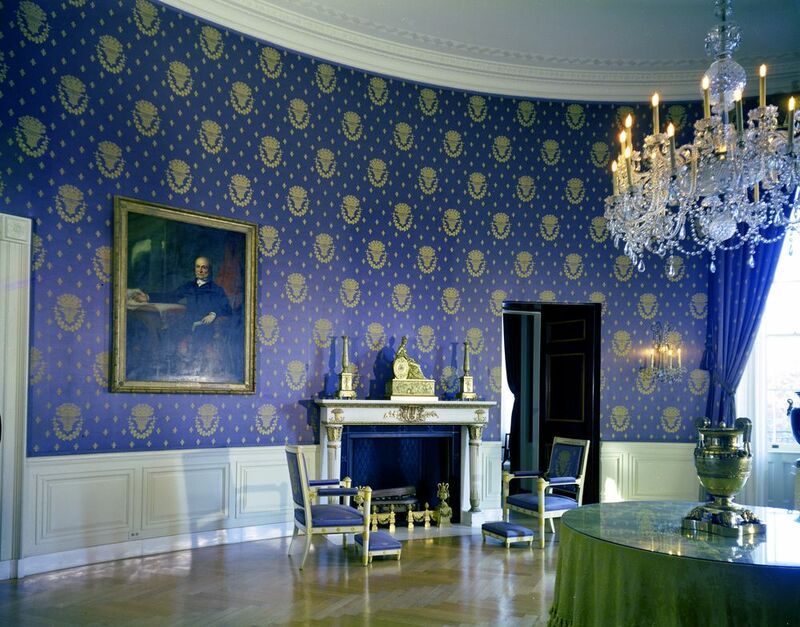 Mrs. Kennedy fashioned the room after the French Empire style, as President Monroe had himself had acquired French Empire furniture for the room after the 1814 White House fire. Two images from the White House Photographs collection show the room’s transformation between November 1961 and January 1963. 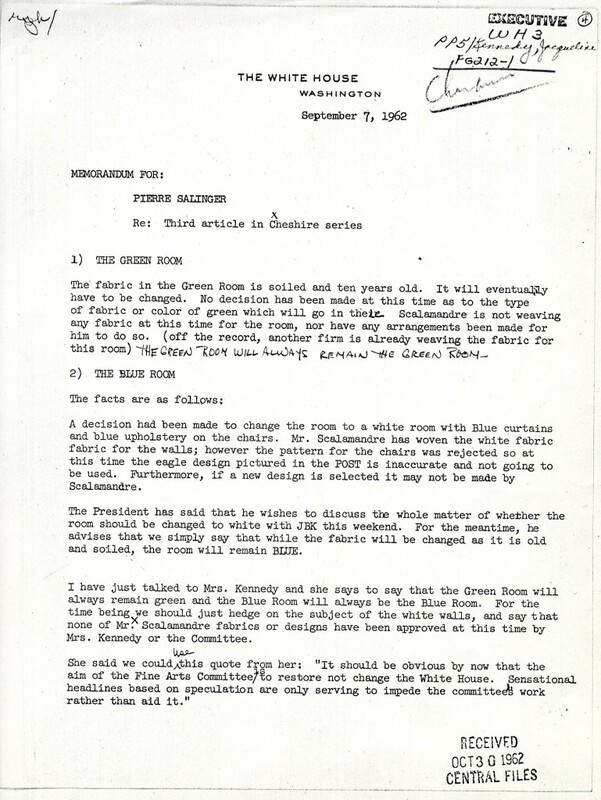 Blue Room excerpt from the Salinger memo; see digitized folder of material here. Mrs. Kennedy’s restoration met with overwhelming approval. She received thousands of letters from the public praising her restoration efforts, especially after her televised tour on CBS. 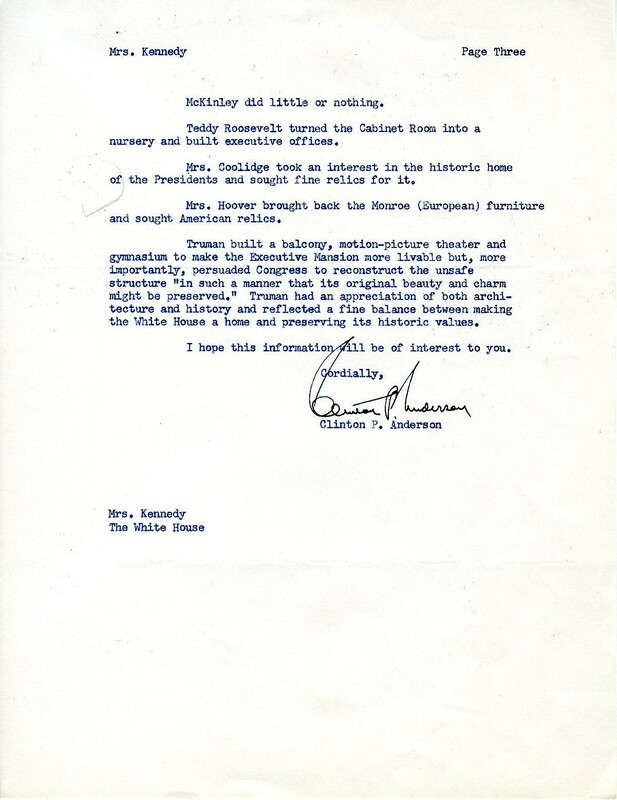 Although some people were not pleased with her efforts, most of the messages sent to Mrs. Kennedy were very positive. 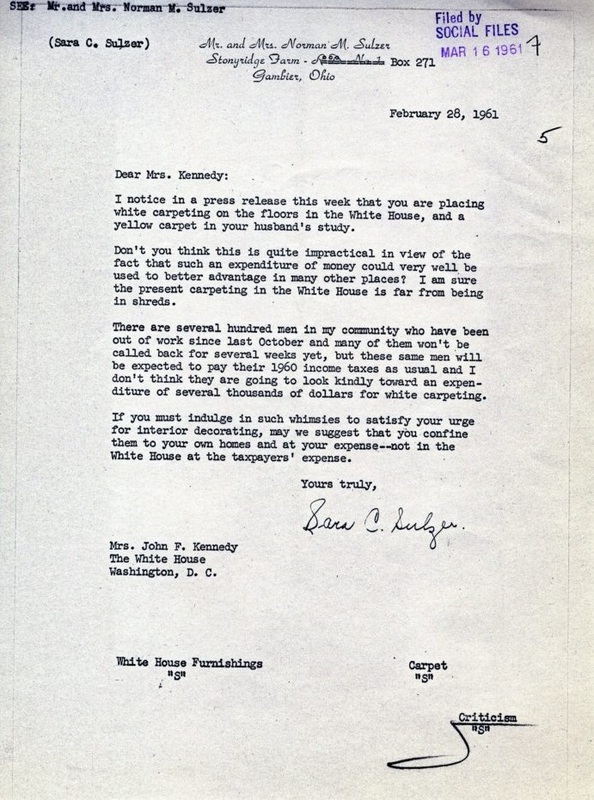 The White House Social Files contain many of these letters, and the letters shown here exhibit two very different reactions to Mrs. Kennedy’s work on the White House. Following the Kennedy restoration effort, an executive order was passed on March 7, 1964 requiring the Committee for the Preservation of the White House to approve any modifications to the State Rooms. The Committee, which included the White House Curator and Chief Usher, would work with each First Family to maintain the historical integrity of the White House. As a result of Jacqueline Kennedy’s work on the restoration project, all administrations are now held accountable for the preservation of the White House. These are just some of the documents that we came across in preparation for our exhibit board; the Kennedy Library holds many more materials on Jacqueline Kennedy’s White House Restoration Project. If you’re interested in researching this topic, we welcome researchers to visit the library.